Yeerongpilly is a suburb of Brisbane, Australia. 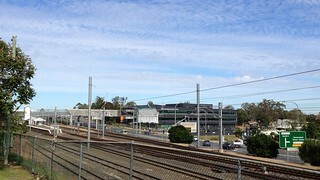 It is eight km south of the Brisbane central business district. The suburb had a population of 1,984 at the 2011 Australian census. It has a large Asian population and a growing Sub-Saharan African population. Yeerongpilly is derived from the Aboriginal words "yarung" meaning sandy or gravelly or "yurong" meaning rain and "pilly" meaning gully or watercourse. Yeerongpilly grew from an area named Boggo, which was logged for timber for Brisbane.